*Strasbourg/CoE/Angelo Marcopolo/- "Too Long", and "did Not get All of it": It's with such Symbolic, Key Words that World Famous American WhistleBlower for Human Rights and Democracy, Edouard Snowden, (After having spontaneously "explosed" with an exceptionally Big Laugh, earlier, when he First Heard about it : See relevant Photo+Video), left "without comment" the Hypothesis that "Special Investigator" Mueller might, perhaps, Continue to Spy on, and "Investigate" even new US President Don Trump, not only during "4 Years" now (2016-2019), but, in fact, as long as ..."20 Years" (See relevant Facts Infra), as "Eurofora" had, provocativelly but factually Questioned in the 2nd of two Queries raised during a Direct Video-Debate at a CoE Conference organized in Strasbourg by French National Assembly's vice-President, MEP Sylvain Waserman, and the experienced Head of CoE's Parliamentary Assembly's Human Rights' Committee, Gunter Schirmer, from Germany, (See f.ex. 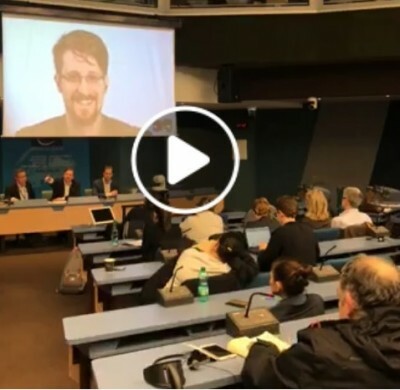 : http://www.eurofora.net/newsflashes/news/whistleblowersineuandcoe.html , etc, and for Snowden's full Reply to a Different Question by "Eurofora" on anOther Issue, at: http://www.eurofora.net/newsflashes/news/snowdenfriendshelpwhistleblowers.html). 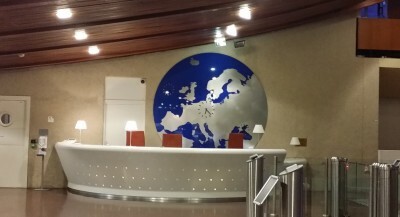 But, Facts are Facts, and a Question is Legitimately raised by simply examining the real Situation : Indeed, "Eurofora"s relevant Query to Snowden, had simply asked him if, given his Experience, he found "Not Excluded", that even simple Critics of at least Some Points of the "Official Version" on what really happened during the "9/11" Islamist Terrorist Attacks, (which has notoriously faced Many and Various Kinds of Criticisism, here or there : Including even by German ChristianDemocrat Chancellor Angie Merkel's current Press Spokesman, previously Journalist ! 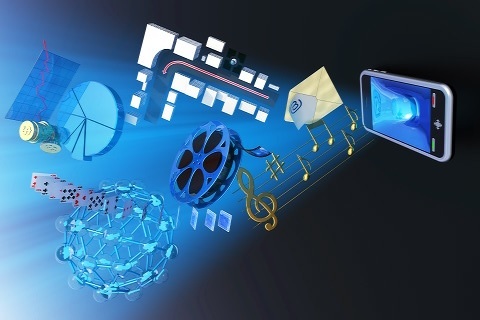 ), might, eventually, have been routinely Spied upon, by Mr. Robert Mueller's agents, (the Current controversial "Special Investigator" on alleged "Russian Interference" in the 2016 US Elections, in "collusion", or not, with New US President Don Trump), since Mueller was, then, (i.e. Back on 2001+), Head of the FBI. >>> Why ? Simply because the current US President has notoriously been, himself, one among the 1st and most Famous Critics of at least 1 Key point in the Official Story on 9/11, particularly because he Strongly Criticized the Way that "World Trade Center"'s Towers' Collapse in a vertical free Fall (which Killed about 3.000 innocent, Civilian People), as he had clearly said and Discussed in Public, then, almost "Live", Commenting at a TV Program, immediately after that Tragic Event, particularly that Strange Way the WTC Towers went Down, one by one, 100% Vertically, withOut falling aSide, and by being Spectacularly Transformed into a strange kind of White Powder, (even from the Top), dispersing around in a kind of "Clouds" of tiny Particles. In Fact, Trump, (whose Family was dealing with Real Estate Business, HeadQuartered at New York), apparently Suspected that, in Addition to the Initial Shock and Fire provoked by Airplanes Crashed into the Upper Middle-Floors of each WTC Tower, there might have been also some kind of Supplementary, Local Accomplices, who would have intervened (f.ex. by placing Explosives and/or something else, on the doomed Buildings), in order to Completely Destroy them 100%, as it was done in fine. According to "New York Times", it's about 1.800 People (mainly at Top Floors), who had initially Survived the First Shocks of an Airplane thrown in each WTC big Tower, but Perished atrociously, Afterwards, during the Total Collapse, (Comp. Supra). However, former "Security" Authorities, including Mr. Mueller's FBI, had reportedly Ignored, or even Denied, from the Beginning, such serious Risks against Human Health, which had been Threatening the Civilian Population of Manhattan's "Bulb" (probably through a Polluted Atmosphere that they had been Obliged to Breath there after WTC's Collapse : Comp. Supra), already Since 9/11, until Recently ! ++ More important, Other Critics had notoriously claimed, already Since 9/11 and Aftewards, that various but converging Early Warning Informations had arrived (particularly from Europe), revealing that Islamist Extermists were reportedly Preparing a Major and Deadly Terrorist Attack, somewhere in the USA, etc, at least Since mid-August 2001 : I.e. 1 Month Before that Mass Killing of about 3.000 People, mainly at New York, but also at Washington DC and elsewhere, in a Series of coordinated Attacks in just 1 Day, as Never Before in all US' History ! - Republican former US President GWBush had allowed 3 Independent Enquiries on that Controversial Issue of WTC's strange Implosion at 9/11 (Comp. Supra): By US Congress (Late 2001), USA's Architects (2002), and NIST's Federal Experts (2005). But "Socialist/Liberal" Dems' former US President Barack Hussein Obama, on the Contrary, did Not let Any such Investigation on Any aspect of 9/11 during 2 Mandates in Office. Instead, even the Wife of a Killed Senior Officer in a Big Insurance Corporation HQ in Chicago, who had naively tried to meet Obama shortly after his Election, in order to ask for a New Enquiry on WTC's strange Implosion, and who was Leader of an NGO of 9/11 Victims' Families, was ...Killed at a strange Airplane Crash, immediately after meeting Obama ! => Thus, IF New US President Don Trump, eventually Decided, later-on (f.ex. during 2018 - 2020), to Launch a brand New, Independent and Efficient Investigation on what really happened on 9/11, and whether there are any Unpunished Complicities, Scandalous Blunders and/or Inactions, Ommissions etc., given all the Above-mentioned Facts, very probably, Mr Mueller might Not be so Happy from the Results... So, ...Better keep Investigating on Trump, his Friends, all his Staff, and his Family, (Prosecuting and ImPrisoning several among them, even for Unrelated petty matters Dating More than a Decade in the Past, when they hadn't even met Trump yet, and/or Threaten him, in Parallel, with "Impeachment", etc., under various Fallacious Pretexts), instead of Letting the new, Democraticaly Elected US President Free to ask himself to Investigate what he may Believe Good for the General Interest ! - Finally, Mr. Mueller was chosen and Hired, as "Special Investigator" of alleged Russian interference in the US Presidential Election" of 2016, won by Don Trump, after a relevant Decision taken by controversial US Deputy Attorney General Rud Rosenstein, ...who Owes himself a Service to Mueller for having given him the 1st Jobs in his Life, at the Attorney General's Offices, in the Past : I.e. an obvious Conflict of Interests and Exchange of personal Favours ! (Rosenstein himself has been Denounced, recently, for having reportedly, planned, during Obama's era, to Spy on Trump since 2015, and to have considered, later-on, to push Trump out of the White House under Amendment 25, i.e. as unfit for that jobn ! Recently, Rosenstein was reportedly ready to Resign asap. on Spring 2019). 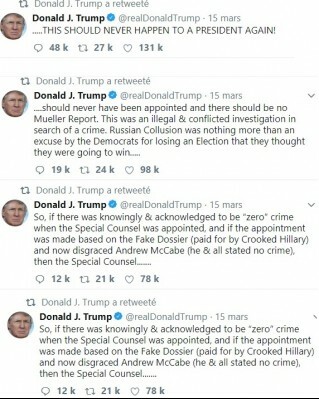 + Meanwhile, by a Surprizing Coincidence, US President Don Trump himself, has just taken the Initiative, exactly ...this Same Day that "Eurofora" Questioned Snowden about an eventually "Too Long" Period of "Investigations" on Trump by the FBI a.o., including by Mr. Mueller himself, (Comp. Supra), to Strongly Denounce, indeed, a Longer than expected Spying/Investigation against him, which would have Started Not from 2017 (Official Apointment of Mueller), neither from 2016 (US Presidential Elections), but, already from Earlier : ... 2015, (full Obama Administration and Primaries for the Presidential Election), while also being too Controversial and even "illegal", as he criticizes ! - Indeed, it's on "March 15" that Trump tweeted about <<"New Evidence" revealing "that the Obama era team of the FBI, DOJ & CIA were working together to Spy on (and take out) President Trump, all the way Back in 2015>>, (i.e. Already Before the US Presidential Election). "Then, the Special Counsel (Mueller) should Never have been Appointed (on 2017), and there should be No Mueller Report", Don Trump points out. Indeed, "This was an illegal & Conflicted Investigation (i.e. full of "Conflicts of Interest" : Comp. also Supra) in Search of a crime. Russian Collusion (Hypothesis) was nothing more than an Excuse by the Democrats for Losing an Election that they thought they were going to win... THIS SHOULD NEVER HAPPEN TO A PRESIDENT AGAIN!" - Meanwhile, however, Mueller's probe has reportedly brought, until recently, about 200 Criminal Charges, 39 Indictments/Guilty Pleas, and 4 Prison Sentences. + More are already in the Pipeline, or risk to appear asap. - F.ex., Paul Manafort, former Trump's Chief Campaigner's main condemnation to Prison concerns simply ...Tax avoidance accusations, allegedly Committed almost ... a Decade Before he Started to work with Trump, and involve Ukrania's internal politics. + Even More UnExpected, the main Charges against General Michael Flynn, a former Trumps' Advisor, do Not concern Russia, but ...Turkey ! ++ Similar Controversial Methods as against Manafort (Comp. Supra) were abused also by Mr. Mueller against Trump's former Lawyer, Michael Cohen : He was Harasssed and Convicted, asking Years in Jail, merely for totaly UnRelated to 2016 Elections' Russian Interference allegations, most of them committed much Earlier in the Past, (including, f.ex., Tax Fraud, Campaign Funds' Irregularities, etc). And once Cohen had been seriously "Cornered" and sentenced to Prison with Unrelated Convictions, he was suddenly Pushed to prolonge his Testimony on the Date that Trump droped a Project in Moscow, from January to June 2016, (i.e., at any case, Before his Nomination as GOP's Candidate). +++ Recently was Added also Roger Stone, a former Trump Campaign Agent, who was accused by Mueller for allegedly "False and Misleading" testimony on his suspected Contacts with ..."Wikileaks", after it became known that the International Organisation of World Famous "Whistle-Blower" Assange, already had many Hillary's hidden E-Mails... I.e. a Strange Accusation, from a Democracy point of view, as if Stone was Accused to Help Reveal to the Peuple the Truth ! - As, f.ex., allegedly Inaccurate Statements made by a Greek and a Dutch Foreigners (Papadopoulos and Van der Zwaan), Merely about the exact Timing (sic !) of some among their lawful Contacts. ... it's only Mr. Mueller's "Genius" which could tell us ! - Thus, he Found "KK", (alias : Konstantin Kilimnik"), a Young Ukranian speaking Russian, reportedly suspected for alleged relations with Moscow's Secret Services, and former occasional Collaborator to Trump's former Campaign Manager Paul Manafort, that Mr. Mueller accused for "Conspiracy" and "Obstruction of Justice" (sic !)... I.e. an Ideal Prey ? ++ Moreover, the alleged "Witnesses" were European (Not USA) Politicians, and merely ..."Potential" Witnesses (i.e. Not Real, Neither Effective) according to Mr. Mueller, while, also, the alleged "Attempt" by K.K. took place as Late as on ... 2018 ! >>> But, in Fact, what was it Exactly about ? - Moreover, they were simple Individuals, Civilian People, (including also a ... "Catering" Private Business, etc ! ), acting Independently, and withOut Any known Link to Trump's Staff, (etc). In addition they were also Supporting Dems' Candidate Bernie Sanders, etc. + As that, obviously, didn't fly high, Mr. Mueller advanced further, Later-on, chosing the Date of US President Don Trump's meeting with Russian President Vladimir Putin in Moscow, on July 2018, in order to reveal that he Indicted anOther Dozen of Russians for alleged Interference in the 2016 US Elections, but, this time, he claimed to have found mainly Agents of a Russian State Security Service. - These are mostly simple Individuals, Citizens who, may be, heard that Trump appeared to be somewhat Less Negative for their Country (Russia) than other candidates, and, naturally, they tried to support him in World Wide Web's Public Discussions, he pointed out, (particularly for the 1st Group : Comp. Supra). What's the problem ?, he wondered. - Russia and USA have concluded a Legal Treaty for "Judicial Cooperation" : Let's use it, as it's normaly done between Civilized Nations, on condition of "Reciprocity" ! We shall Help USA's Authorities to Interview those that they suspect for alleged wrongdoings, and make relevant Investigations even here, in Russia, if they accept to Do the Same for the Russian Authorities' interest to Interview a Rich Businessman, accused also for Tax Fraud and several Hundreds of Millions $ of Debt, in addition to reportedly Slandering the Russian Government also during Elections' Time, even for alleged "Murder", f.ex. in the "Magnitsky" case, in the recent Past, he reminded, proposing to cooperate in reciprocal investigations asap. - "After all, it seems that what they Revealed was Not Fake, but simply the Truth ! Wasn't it ? What's Bad into simply Revealing the Truth about Politicians, to the People ? ", Putin reportedly Wondered. Indeed, it seems that Neither Hillary, Nor Mr. Podesta, or the DNC, did Not ever Dispute the Truefullness of the Contents in their Emails and/or other relevant data, Published by "Wikileaks", etc. Snowden is apparently cooperating, sometimes, inter alia, also with "Intercept"'s Journalist Greenwald, a declared Leftist, who has, nevertheless, Strongly Supported recently New US President Don Trump, against "Deep State"'s Harassment and Threats, Opposing them elementary Principles of Democracy, which exclude anyone's attempts to Hinder a Democratically Elected US President from applying the Program for which the People Elected him, (particularly in "Hot" Areas of General Interest, such as World Peace, etc : See f.ex. ...). Greenwald is Friend also to Famous, Historic "Guru" of Leftists Worldwide, Philosopher Noam Chomsky, who has, even himself, felt, more recently the Need to Defend Trump against his various "Deep State", UnDemocratic Persecutors' Harassment, brandissing even Higher, Otherwise, a Growing Risk of Dangerous International Tensions, and even War, (See, f.ex. : ..., etc). Recently, Dems' Shamefull and dangerously Damaging Behavior, seeking to Slander US President Don Trump, by organizing a Public Hearing of a Controversial "Witness", (in fact a Prosecuted former Lawyer, notoriously ready to say anything that Mr. Mueller and his Cronies might desire, just to Ease the Prison Sentences threatening him), at precisely ...the Same Day that Trump was notoriously Trying to Solve the Crucial and Complicated Issue of Korea's DeNuclearisation, at a Bilateral Summit with North Korean Leader Kim in Hanoi, Vietnam, i.e. Adding Heavy Pressure over the embattled US President, with the Result to Push towards its Failure, with Dangerous Conseqences against World Peace, proved that Professor Chomsky's and Greenwald's Warnings were, unnfortunately, Right (Comp. Supra). 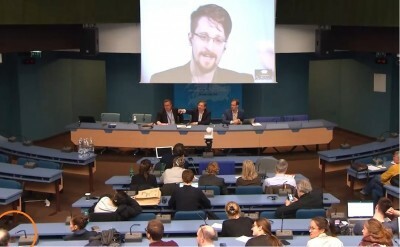 "Eurofora"s 2nd Question to Snowden (Comp. Supra) might have been, indeed, "Too Long", but "Whistle-Blowing" Journalism often Needs an elementary Vital Time in order to resume hastily some Complicated Issues, while also trying to avoid too many Risks. On the Contrary, Mr. Mueller's Oppressive Circus, obviously Threatening the American Democracy and even the World Peace, (Comp. Supra), has unequestionably Durated for Too Much, already Harmed too Many People, and must urgently Stop, at last, in one way or another, Before it might provoke Serious and Irremediable Harm also for the Society and the World. But the Real Questions, previously Censored or Skiped during a Too Long Time, should, at last, Freely Bloshom and Flourish ! Without excluding also the Question : Why Mr. Mueller is so Eager to Harass the new US President Don Trump and his Staff ? Perhaps, because he might be Afraid that Trump (if he had enough Time to Govern without Imposed Distractions) would, eventually, ask also for an Investigation on what Mr. Mueller himself had been doing (or not doing..) since 9/11, until 2019 (Comp. Facts cited Supra) ? 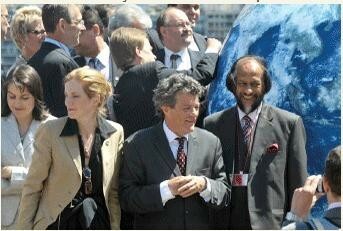 It's at a splendid Natural landscape, inside a Forest plateau with superbe view over Paris, at Saint Cloud, that the incoming French EU Presidency had the good idea to join together all EU Member Countries' Ministers of Environment and Energy, in two overlaping EU Councils in a series, from 3 to 5 July 2008. 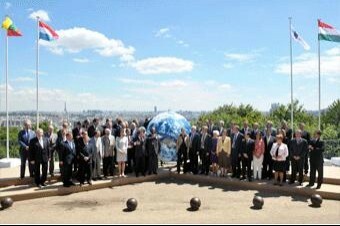 Fresh rain happily dissipated July's heatwave, before a bright Sun shined at the conclusion of the EU gathering around a huge statue of Earth (See Photo). French super-Minister of State for Energy, Transport and Environment, Jean-Louis Borloo, and Minister for Environment, Nathalie Kosciusko-Morizet chaired the first EU Ministerial meeting at Paris' area, together with EU Commissioners Demas and Pielbags, surprising Journalists with improvised Press-points, at key-moments of the discussions. 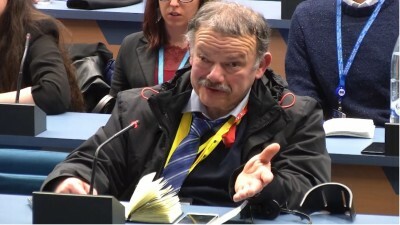 Environment and Energy are key to the development of New Technologies to boost Europe's role in the World, while also responding to Citizens' concerns, stressed Borloo, speaking to Journalists earlier in Strasbourg. According to well-infomed sources from the French EU Presidency, the aim is to stimulate a growing trend inside EU Parliament, via various on-going Reports developping in parallel, towards achieving the necessary targets before December. For this purpose, Top-level representatives from Borloo's super-Ministry are expected to come in Strasbourg during EU Parliament's plenary, next Wednesday, a key official told "EuroFora".